EdTech from the Valley: EdTech ..... InfoTech.... is there something we can learn from the business side? EdTech ..... InfoTech.... is there something we can learn from the business side? NOTE: This has been one of my works in progress since the middle of November, but many other things have gotten in the way! Please excuse the length and the and gap between blog posts. I have figured out that it is much easier to make several smaller posts and keep them coming more frequently, than to work on one HUGE post. Take a look at the graph above. Does is hit you over the head, like it does me? There's a gap that we have to fill... problem is that there isn't a foundation to build upon that will be stable enough to carry the weight of the structure we need to create. Therefore, we need to look elsewhere for models that can be adapted to help us fill those gaps. Over the past several months I have been reading lots of different things, some of which have come from the 'business' or 'high tech' field. And some of the ideas I saw, I thought I could apply to EdTech literacy and integration. So, I am going to take one article I have read from the High Tech field that has a lists of things professionals should do and tweak them a little with an EdTech spin. Taken from InfoWorld's October 16, 2006 edition: "20 Tips to get Promoted." I am going to change this a little bit and make it... "20 Tips to build your EdTech Program." This was actually titled, "Think Business First, Technology Second," but since education is our business, it was OK to change it. I think too many people get caught up in the idea that technology in education is a panacea, it's not. What we are doing today is the same thing that we were doing 20 years ago, we are teaching students to become active and literate members of the society. Folks... we are teaching literacy, not technology. Technology is just the conduit that makes all of this easier and more valuable to our students. 2) Raise the Bar... and Leave It There. Having high standards is what all teachers believe they have for their students. The disconnect I have is that once many standards are set, there aren't enough intermediate check points for students to perform a self-evaluation and receive some feedback regarding their progress. Teachers are the one's that set the standard, but also must be the one's to create the checkpoints for students to receive the feedback they need. 3) Hold your Nose and Raise Your Hand. In the 'InfoWorld' article, this related to the idea that you should volunteer to do the tasks that no one else wants to do. In relation to EdTech, this means doing the ground work to make the resources accessible and available to students. You need to be the one to create the accounts on what ever software application or service your students will be using. You need to be the one that goes in to make sure that the applications are loaded on the computers, the bookmarks are added to the browser to make a certain sites available to students, so that they aren't spending the entire period trying to find the site you want them use. In you are the EdTech leader in your school or district, you need to act like Harry S. Truman. "The Buck Stops Here" You need to be prepared to answer any question in relation to tech resources/assets that are available within your school/district. If you don't have an answer or can't definitely answer someone, promise to find the answer and give them some response. I have tried to do this with most of the tasks I perform as the Tech Coordinator of the district, and for the most part, I am able to get back to people within 24 hours of their initial request / question. If you feel strongly about something, you need to be willing to stand behind it. This is the way I feel about Web 2.0 and its application into the educational environment. I may not be the most popular because of this stance, but I know deep in my being it is the right thing to do for the kids we teach. When things don't exactly go the way you want them to go, admit it. But, do not let being incorrect in one instance deter you from moving forward with what you know to be the right thing to do for the students we teach. One of the phrases I use with people all the time is... "If you don't ask the question, the answer is always, 'No'"
To me, this all happened in the last 18 months. I started subscribing and reading blogs. This led me to books that interested me in the directions I thought education is going. Personally, I have read more over the past 18 months than I did when I was in my 20's. In the past year, I have read 10-12 blogs on a daily basis ( I don't read every post, I only read the posts that interest me.) to keep up on what the conversation is in Educational Technology. I have also read; 'The World is Flat," "The Tipping Point," "Being Digital" and "Convergence Culture." This directly relates back to #8. In order to stay on the cutting edge, you have to feed your mind and constantly be learning something new. This leads me to the quote I have on my blog and is something I try to live by. "There is a big difference between teaching thirty years and teaching one year thirty times." Is information going to stay static? How much has your field changed since you graduated from college? Shouldn't your teaching refelect the changes in your academic field? Find mentors where ever you can. They don't have to be green, lived for 300 years or have pointed ears, they do have to have qualities that you feel are exemplary and will help you grow personally or professionally. I have had a ton of great mentors, most of them never knew they were my mentors at the time, but I can list four off the top of my head. Some of the phrases I have used in this blog post came from a coach I worked with a few years ago. The reason I finally decided to enter into the realm of educational administration came from having a principal who was a educational leader, not someone who is just trying to get to the end of the year. Thanks Tess! Deadlines are always difficult to deal with, especially when they come too quickly and they don't give you enough time to do the best possible job. The only thing I can say here is: Plan, Plan and Plan. One thing you can always count on when dealing with Educational Technology, it's NEVER going to go completely right. Have several backups! Anytime you achieve something, make sure you share what ever kudos come your way with the people around you. In EdTech, that can be the computer technician, the Tech Director, a teacher that served as your guinea pig when you were developing your new program. Recognize everyone, regardless of their role and its significance in the big picture. You can be doing great things at your school and noone will know it. Personally, I have had a tough time with this one, since I figured that if I am doing something well, it will eventually get noticed. Why wait to get recognized? If you are doing something well and tell people about it, it will increase the number of people that can benefit from it. What is one of the best ways to be your own cheerleader? Blog! Like this one! Keep records of everything you are doing. Storage space is cheap and you never know when something you have done in the past will fit in nicely with what you or someone else is doing and you can repurpose something you had archived. 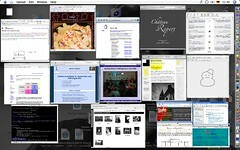 Find ways to post your work on the web. The quickest, easiest way to do this is to have a wiki for each of the classes you teach. I have a wiki for both my Cisco Networking Class and Computer Systems Design class. Anytime someone asks what you have done, you can instantly direct them to one of your wiki sites. I often get schmoozing confused with being a brown-noser, but there is a subtle difference between the two. Schoozing means keeping the lines of communication going, even though they might not be 100% in your favor, it is definitely a two-way communication, where there is an exchange of ideas. In brown-nosing, there is an appearance of two-way communication but it is only a facade, the communication coming from your end is you putting up a mirror and reflecting back what ever the other person says. This is also a whole lot easier in the digital world, where there are many, many more outlets to interact with people using message board, instant messaging software, blogs (like this one!) and wikis. So, schmoozing is OK... and there is a play on words here that helps. Some people say, "Its not what you know, its who you know." I want to twist that around a little and say, "Its not who you know, its who knows you." This is a double edged sword for me... There are two meanings I take from this phrase. The first is to 'Walk your talk,' which goes back to my days in athletics, where you better be prepared to perform if you are going to say something about it. The second meaning, I take from Peters and Waterman's book, "In Search of Excellence." The phrase, "Management By Walking Around," was a central theme in the book and I feel that it is important get out and see how people are using technology on my campus and other campuses in our district. Gray areas... let's talk black areas! There are times when you don't have a clue about how to implement something, you just have to find ways to get something to work. Now, this doesn't mean drop everything else to make one thing work, but what it does mean is keep moving forward until you get stuck and then take a break. Taking a break of a few days, a week or even longer can give you a fresh perspective. The other thing that happens, is that by giving yourself some time and discussing things with people you work with or online, via blogs or message boards, can give you a solution to your block. There have been projects that I left hanging for a few months and kept in the back of my mind and had something hit me out of the blue that solved the road block I had hit. I'm all about pushing the agenda forward. I know that this makes some people feel uncomfortable, but you always need to make sure that what ever you do, you have a sound educational purpose in doing it. Administrators can't argue with something that has a strong educational purpose. You may be asked not to do something, but there won't be any disciplinary action. Just remember that more than half of all teachers leave the profession within the first five years of their career. It takes a special breed to teach over the long haul. After the first five years, switching in education doesn't happen too often, if at all. In our district, I see a few teachers coming in from other districts for monitary reasons, otherwise there is usually some other mitigating factor (Spouse's employment, health of a parent, etc.) for a teacher switching districts. Well, its been ... long... drawn out... and finally finished. I know it's not something that everyone will use, but it's worth a look and maybe find one good idea to use in your school.